Ok, so Thursday again. 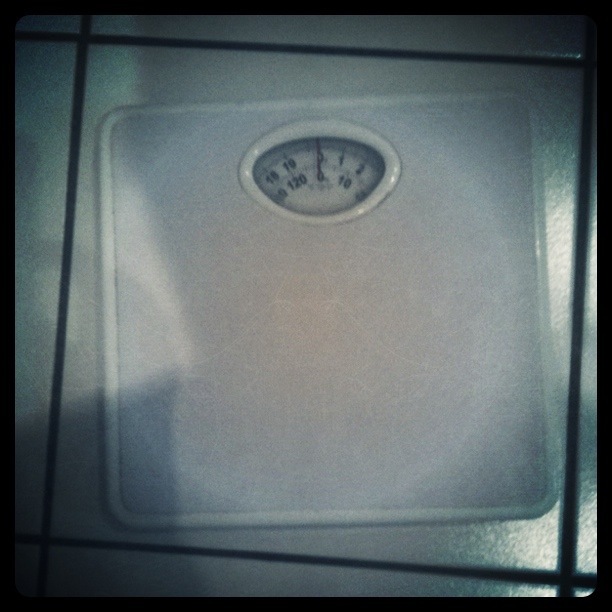 In my house this has now become known as weigh-in day, cue scary music. In the interests of honesty, and avoidance of self-denial, I have been asking the lovely Mr B to check the scales for me before he potters off to work. But this morning I just could not be bothered to get out of bed, let alone stand naked in the FREEZING cold bathroom. So warmly snuggled up in bed I stayed. Thinking it is unlikely possible that I may have lost a pound or two. More guilt, until just now I figured I may as well get up and just go do it. No really, I cannot read the scale. It is all blurry. To read it I have to bend right down, which interestingly makes me lighter, how does that work? But standing up, and I am no giant, not a hope. Well, what a revelation, I am short-sighted. Confession…I am also an optometrist by trade. How embarrassing. So, with the help of Mr B’s WAY TOO STRONG glasses I think I weigh about the same, but less if I bend down. Jeez, had better book an eye test. Love from the fat-one who is soon to be the speccy-fat-one. OOOOOh No! Don’t want to see it in big digital numbers…then I may have to believe it is true. Hmmmm, but that didn’t happen when we shared an office….. wonder why! I havent been near the scales since the arrival of Little A but when I do I shall be leaning down!!!!! Funneeee! Good luck with the belly busting. Our scales are out of battery. And they can stay that way! She’s asleep on the bed next to me right now (I’m sat up with the laptop), but she has that amazing newborn ability to tell the difference between my bed and her cot, so as soon as I try to transfer her so I can get some sleep….wide awake! I’m sure I’ll sleep again one day. Until then I’m surviving on extra helpings of toast and jam through the night, which is why those scales can stay dead!